"And He showed me that it was His great desire of being loved by men and of withdrawing them from the path of ruin into which Satan hurls such crowds of them, that made Him form the design of manifesting His Heart to men, with all the treasures of love, of mercy, of grace, of sanctification and salvation which It contains, in order that those who desire to render Him and procure for Him all the honour and love possible, might themselves be abundantly enriched with those Divine treasures of which this Heart is the source. He should be honoured under the figure of this Heart of flesh, and Its image should be exposed ... He promised me that wherever this image should be exposed with a view to showing It special honour, He would pour forth His blessings and graces. This devotion was the last effort of His love that He would grant to men in these latter ages, in order to withdraw them from the empire of Satan which He desired to destroy, and thus to introduce them into the sweet liberty of the rule of His love, which He wished to restore in the hearts of all those who should embrace this devotion." Most Sweet Jesus, I wish to love Thee with all my heart for Thee are indeed my best and dearest Friend. I am sorry for having offended Thee. By the love of Thy Sacred Heart help me to sin no more. To supply for my coldness and want of love I offer Thee: the love of St. Peter and St. Paul, the love of St. John and St. Magdalen, the love of all Thine Apostles and Saints. Above all, I offer Thee the love of Thy Holy Mother and St. Joseph. In the name of all these Holy Saints, I beg Thee, dear Jesus, to make me love Thee. I implore Thee to forgive me all my sins. I beg Thee most earnestly to give me boundless confidence in Thee. 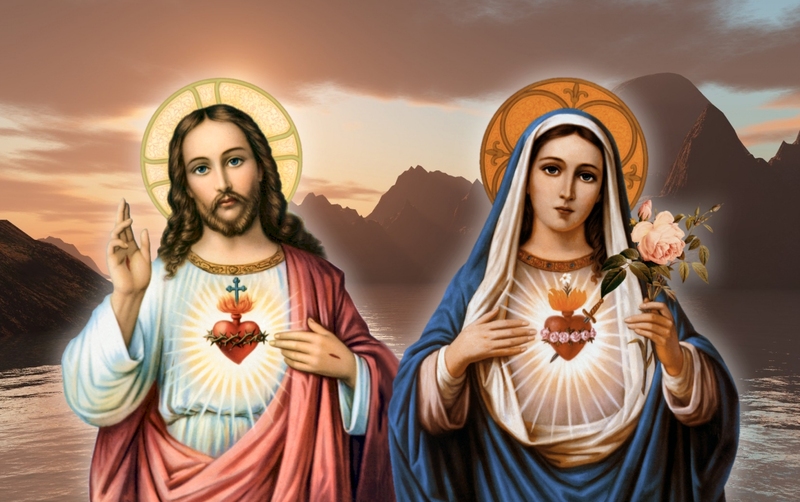 I ask Thee to grant me the fullness of the graces Thou didst promise to all who are devoted to Thy Sacred Heart. Thou doth wish to enter the houses of all. Come, then, dear Jesus, into my house, into my room, into my heart and remain with me always. I receive Thee with the same love with which Zacchaeus received Thee; with the same affection with which Martha and Mary received Thee; I offer Thee the love with which Holy Mary and St. Joseph received Thee each time Thou didst enter the house of Nazareth. Give me a little of the love and the peace that Thee gave to them. Grant me the grace of a most holy and happy death. Bless me and protect me against all evils, dangers and temptations. Above all, teach me to love Thee. Sacred Heart of Jesus I have confidence in Thee, immense, unbounded confidence in Thee, always and for everything. When I say that I have confidence in Thee, I wish to offer Thee all the confidence and love of Thy Own Blessed Mother. This supplication would be well to pray before the recitation of your Rosary each day. In this way you would not neglect to offer all Rosaries in unity, as so many graces can be gained simply by praying in unity. Spread the word to those who can be most instrumental in having it spread universally. It is a very valuable addition to the devotion to the Rosary. Blessed Mother, come stay with me. Celestial, holy and heavenly family, come pray with me, and offer all the Rosaries that ever were and ever will be to our heavenly Father for all worthy humanity. Let its power conquer hate and iniquity, fill the world with peace and harmony, crush the head of Satan, who lies in wait so stealthily. The Almighty Majesty promised this would come to be. Lord, let my lowly Rosary add strength in unity so the power of the devotion to their Lady's Rosary will be spread universally, and God's Will will be done on earth as it is in eternity. For these graces we humbly thank Thee.